Renowned British bookmaker William Hill Poker are offering an incredibly good deal for their poker-playing customers over the next few months as they reduce the buy-in for their splendid Sunday Blast tournament to half the normal price while retaining the guaranteed $200,000 prize pool. Yes, it’s going to be a great summer for William Hill players with the usual buy-in of $200+$15 reduced to just $100+$9 over three of the next four months. That’s April, June and July, just to be sure – as May is not included in the promotion! 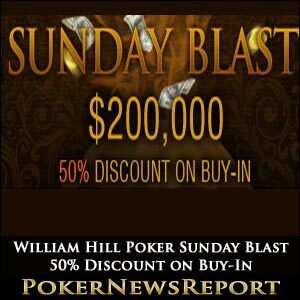 Really, this is a fabulous deal for poker fans, with the half-price Sunday Blast dates being April 1, June 3 and July 1. Each event will start at 16:00 GMT (Greenwich Mean Time) and, of course, be priced at just $109 to enter. However, William Hill Poker are offering satellite entry competitions that will reduce that outlay even further, so maybe it’s time to get on over to this wonderful website to make your play at the huge prizes available. 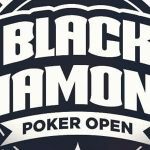 The satellites have already started and players can earn a ticket to the big event without paying a penny – or cent, for that matter. 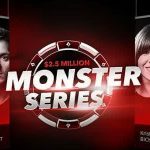 Additionally, poker players can use WHPoints to make the Sunday Blast that can be earned over three four-week qualifying stages, with the April event’s period ending on Wednesday, March 28. This will, of course, be too late for many players to make April’s special Sunday Blast, but the June tournament has a qualifying period that begins on Tuesday, May 1, and ends on Monday, May 28, while the qualifiers for July’s competition starts on Friday, June 1, and concludes on Thursday, June 28. Just 350 WHPoints are required each month to be awarded a freeroll entry that will provide 20 Sunday Blast tokens for the lucky entrants. 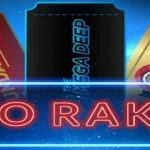 The April event’s freeroll takes place next Friday at 20:00 GMT, while the June freeroll is on Wednesday, May 30, and the July event takes place on Saturday, June 30 – again at 20:00. Moreover, earning at least 35,000 WHPoints will guarantee a player an automatic seat at the appropriate Sunday Blast event. It’s a deal that is too good to miss, so – if you haven’t already signed up to William Hill Poker – it is surely about time you visited their website to take advantage of the incredible 200% first-deposit offer exclusively available through the following William Hill bonus code ‘BONUSWHP’ that will provide you with as much as $2,000 – or £1,250 – as well as entry to four exclusive $1,000 new depositor freerolls. 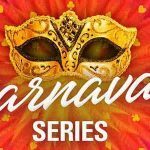 The first-deposit bonus will be redeemed in increments of $5 each time you gather 350 WHPoints, with the points being handed out at the rate of 30 per $ – and 45 per £ – from events entry fees and also six per dollar (nine per £) on cash ring tables. William Hill allow a very generous 90 days to claim back as much of that bonus as possible, with the poker room providing progress reports in relation to your William Hill Poker bonus through a tracking facility in the lobby under the ‘Bonuses’ tab. Once a player has cleared the requirement (or the 90-day limit has ended), they can use their WHPoints to take part in the William Hill Poker Reward Scheme. The scheme encourages players to continue playing at William Hill Poker once clearing the first-deposit bonus – and allows customers to convert points into cash, use them as buy-ins to events or to trade for William Hill Poker goodies in their online shop. Of course, you won’t need to have gained all 131,250 WHPoints to take advantage of this offer as just 3,750 will get take you to the first-level cash transfer, while only 500 WHPoints will allow you to take part in rewards programme’s freerolls.